Leonard Gomella, MD, is the Bernard W. Godwin, Jr. Professor of Prostate Cancer and Chairman of the Department of Urology at the Sidney Kimmel Medical College. He joined the Jefferson faculty in 1988 and was appointed Chair in 2002. He serves as Senior Director for Clinical Affairs for the NCI designated Sidney Kimmel Cancer Center at Jefferson, Clinical Director of the SKCC Network and Urology Chair for NRG (RTOG). Dr. Gomella is involved in translational basic science and clinical research in the development of new diagnostic techniques and treatments for prostate and bladder cancer through the Sidney Kimmel Cancer Center as Co-Leader of the Biology of Prostate Cancer Program. In 1992 he led the team to first use molecular techniques to detect circulating tumor cells in prostate cancer He has given over 500 presentations, written over 400 papers, and edited dozens chapters and monographs in the field of Urology. 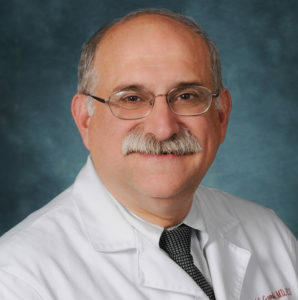 Dr. Gomella has authored and edited 63 editions of 17 different books for medical students, residents, and practicing physicians including the “Clinician’s Pocket Reference” (aka “The Scut Monkey Book”), “Five Minute Urology Consult” and is Editor-In-Chief of the Canadian Journal of Urology. “Recovering from Prostate Cancer”, written in 1993 by Dr. Gomella was the first book published for the general public specifically on the topic of prostate cancer. “Best Doctors in America”, “Top Doctors for Cancer”, Philadelphia Magazine’s “Top Doctors” have recognized him for many years for urologic oncology and prostate cancer including a 2015 national recognition in Newsweek. In 2007, Men’s Health Magazine listed Dr. Gomella as one of the 20 top urologists in the US. Awards have included the American Cancer Society "Volunteer Achievement Award" and an “NCI Achievement Award”. He has been President of the Mid-Atlantic Section of the AUA and elected to the American Association of Genitourinary Surgeons and the prestigious Clinical Society of Genitourinary Surgeons. The University of Kentucky College of Medicine awarded him an "Distinguished Alumnus Award” in 2009. From 2015-2017 was President of the Society of Urologic Oncology. In 2015 he received a “Distinguished Contribution Award” from the AUA and Jefferson honored him with the “Jefferson Achievement Award in Medicine”. Leonard G. Gomella, MD, FACS, discusses the evolving role of genetic testing for inherited family risks in prostate cancer patients. He advises urologists to be attentive to recent developments in genetic testing in order to better detect cancers in individual patients and their family members. 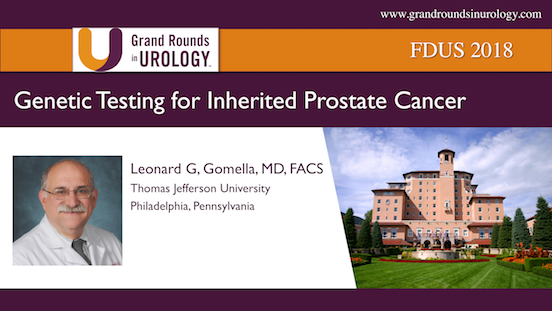 Leonard G. Gomella, MD, FACS, led the “Next Generation Therapeutic Layering and Sequencing” session at the Future Directions in Urology Symposium (FDUS) 2018. These consensus statements represent a comprehensive analysis of current issues, challenges, and advancements in urology from a panel of international experts. Leonard G. Gomella, MD, FACS, reviews the basic scientific concepts of immunotherapy for bladder cancer, from why BCG is the “gold standard” of treatment and describing the mechanics of augmenting the immune system to eliminate tumor cells, to categorizing therapies into vaccine based, cytokines, monoclonal antibodies, checkpoint inhibitors, and CAR-T cells. He also explains why, generally, immunotherapy is particularly effective in the bladder cancer setting, as opposed to other cancers. Ask the Expert: What Combination Drugs with Radium-223 Are Best for Treating Prostate Cancer?